I am all for learning about different cultural traditions. One of the best parts of travelling and living in a foreign country is the opportunity to pick up new ideas for entertaining at home. Particularly, when cultural traditions involve the consumption of almond paste, sugar and dough. I can’t complain. Semla is a Swedish cardamom spiced wheat bun (from the word referring to semolina) filled with almond paste and topped with whipped cream and icing sugar. It was traditionally consumed on Shrove Tuesday (Fat Tuesday-) before the Christian holiday of Lent. Like Halloween and Christmas, baking and eating semla grew from a one day affair to a January to Easter affair with the height of semla-craziness in February. Hence why all the bakery windows were overflowing with semla last weekend. I wonder if people have semla parties?! Apparently, Semla is taken quite seriously in Sweden (variations of this bun are also consumed in Denmark, Finland, Iceland and Norway). 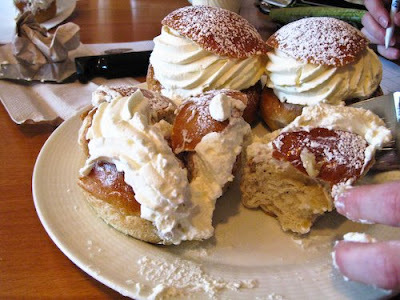 There are semla competitions with judges and even an undercover blogger (see Semelmannen’s Tumblr blog) who eats one semla a day in a bakery around the city in an attempt to rate which bakery makes the best bun. Now that’s my kind of research. Interestingly, in 1771, King Adolf Frederick of Sweden died after eating 14 semla (his favourite dessert) which followed a rather indulgent, rich dinner. I don’t know about you, but semla looks like the kind of item that I could consume all year round. Why wait for February when you are already feeling full from the holiday season? You could easily serve a semla in the summer with berries- (is that sacrilegious?) or in the fall with a cup of tea. I’m just showing my appreciation and trying to put my own spin on this almond paste and cream filled deliciousness. What do you think? Once a year or year round item? Feel free to chime in on Facebook or leave a comment below. Of course, the important lesson to take away from this post is– semla in moderation, if you don’t want to end up like the King!! Check out Countlan’s semla board on Pinterest for more inspiration. Recipes for Semla- Why wait until February/March to Eat Them!? Those Semla were everywhere this weekend! I only found out it was a “temporary” thing when I was back home. I totally prefer things to be seasonal as it makes you long for it (in the summer with berries sounds lovely though!) and makes it a little bit more special. It was great meeting you both this weekend! I know! I was disappointed too that they were seasonal. Oh well. another reason to learn how to bake something new. Sarah, I am gutted I did not try the Semla at Bemz, but was rather full after that Scandic breakfast. I’ll definitely seek it out the next time I visit Sweden. Hi! I know I was so full too. You don’t have to return to Sweden though, you have the amazing Nordic Bakery in London!! http://www.nordicbakery.com/ Have you been? I think there is a location in Fitzrovia. Until the next time.